I almost met Senator Jesse Helms. It was the fall of ’89, and I was Associate Professor of New Testament at Midwestern Seminary in Kansas City when the call came. First Baptist Church of Raleigh was looking for a new pastor, and I had been asked to preach for the search committee. My friend, mentor, and teacher, Dr. George Balentine, was pastor of the Hayes Barton Baptist Church in Raleigh, and he offered to let me supply the pulpit for him so that the search committee from First Church could hear me preach. At 11:00, George and I entered the sanctuary for worship and took our seats on the chancel. 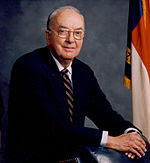 He leaned over and whispered to me: “Don’t get nervous, but Senator Jesse Helms is here today.” I got nervous. I knew Senator Helms was a member of Hayes Barton, but I figured that with George out of the pulpit, and with the Senator’s busy schedule, there was not a prayer that he’d show. And yet, there he was. I nodded to him, and he nodded back to me. Don’t remember what I preached that day; doesn’t matter anyway. Other than that nod, I never met Senator Helms; I was spirited away immediately following the service to meet with the search committee from First Church Raleigh where I was to serve as pastor in the 90’s. I would later learn that Senator Helms had been a member of First Baptist Raleigh during the tenure of my predecessor, Dr. John M. Lewis, during the tumultuous 60’s. He left the church over Dr. Lewis’ stand on the civil rights movement – Lewis was for it; Helms was against it. He joined Hayes Barton, but the two of them remained friends nonetheless. Senator Helms later came around to Dr. Lewis’ point of view on that issue, and who knows how many others. Senator Helms grew up in the Piedmont of North Carolina and knew, and related at close range with, many people of African-American descent. I rather suspect that his early opposition to integration grew more out of his distrust of big government (President Johnson’s “Great Society”) than it did dislike or distrust of people of color. But who knows? I don’t. All I know is that though the Senator and I would have been on opposite sides of a number of issues I nonetheless admired his integrity (a quality all-too-lacking these days), his stubborn refusal to do “group think” no matter what group is doing the thinking, and his willingness to go-it-alone, if need be, for the principles he believed in. A conversation about things theological – those places where God slips in and sneaks through…mostly unnoticed. I try to notice.